It’s a nature name that could be very on-trend for boys, boosted by a recently canonized saint. Thanks to C in DC for suggesting Junipero as our Baby Name of the Day. Back in the 1700s, Miguel Serra became a Franciscan monk. Born in Spain in 1713, his family was poor but devout. Young Miguel took the name Junipero along with his vows, and became a missionary to California. Tales about Fra Ginepro were popular. He was known for his tremendous generosity – even giving things away that weren’t his. It’s a fitting name for a Franciscan, but since Miguel spoke Spanish, he took the Spanish form of the name: Junipero. During his 2015 visit, Pope Francis canonized Junipero Serra, making Serra the first saint canonized in the US. It’s not without controversy. Serra founded missions in California, beginning in San Diego in 1769. The goal was to convert the natives to the Catholic faith, and to work with Spanish officials, both religious and secular. Native Americans associate Serra and the missions with the destruction of their culture. Even without the new saint and the stories about Saint Francis’ generous companion, the name would have some appeal today. The berries were used as a spice and an herbal remedy from the ancient world onwards. Varieties of juniper can be found from Africa and Central America to Europe and even the low Arctic. Juniper has caught on as a girls’ name in recent years. There’s no data on Juniper as a given name in the US prior to 1969. Credit probably goes to Donovan’s single “Jennifer Juniper,” released in 1968. Inspired by a real life Jenny, the single enjoyed modest success, and may have inspired some parents. Or maybe it was the first Junie B. Jones book, published in 1992. In 1992, there were five girls called Juniper. In 2005, 49 girls were given the name. By 2014, there were 633 newborn Junipers, enough for the name to rank #490. Junipero is so rare that it doesn’t register at all in the US. But, beginning in 2012, there have been at least five boys named Juniper every year. It’s a tiny number compared to the girls with the name, but I suspect it may be in homage to Serra. 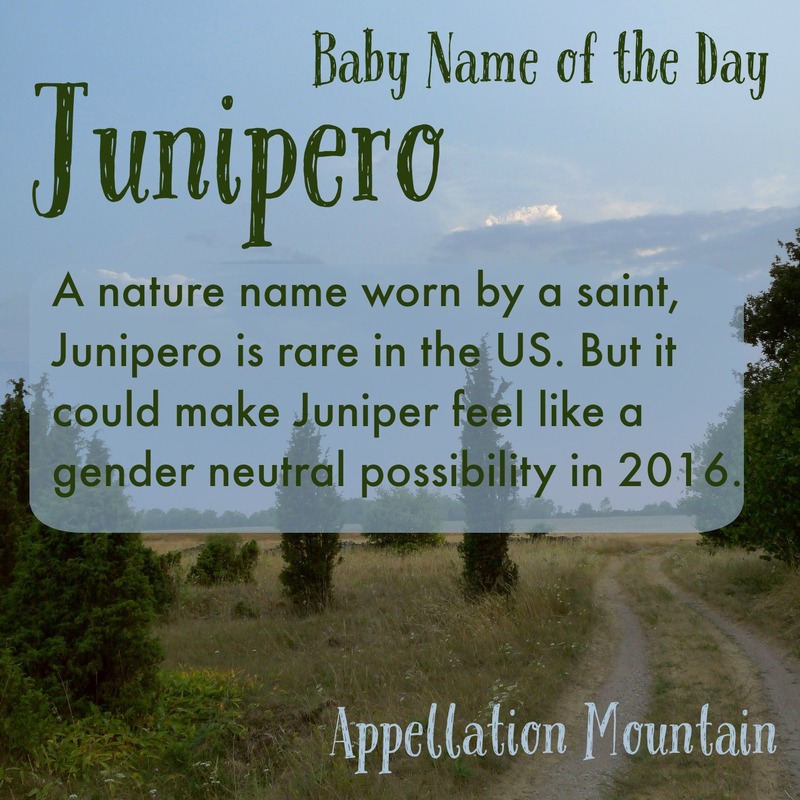 If you’re after a nature name rich with meaning in the Catholic faith, Junipero is a great name for a boy. And if Spanish isn’t your family’s language, then I think that Juniper works beautifully, for a son or a daughter. What do you think of Junipero? Does Juniper seem like a gender neutral possibility? I prefer Juniper for boys rather than Junipero. 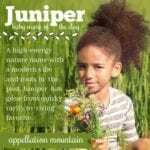 I like Juniper and had only heard of it being used for girls, but think it would work well for boys as well. Junipero is all Father Serra to me.